Despite the absence of key players Emiliano Moretti and Ciro Immobile, Torino clinched a 2-1 victory over Cagliari on Sunday afternoon. As expected Riccardo Meggiorini replaced Immobile, however Migjen Basha was suprisingly chosen in place of Moretti, with Nikola Maksimovic reverting to centre back. Cagliari striker Nene had the first real chance of the game, but after turning Maksimovic, the Brazilian striker blazed over the bar. At the other end, Riccardo Meggiorni came close to scoring his first goal of the season but his effort went wide of the post. On the stroke of half time, Torino took the lead as Alessio Cerci's teasing cross was met with a diving header from Omar El Kaddouri who scored his fourth goal of the season. Meggiorini came close to extending Toro's lead with a left footed effort from distance, but his striker was tipped round the post by Vlada Avramov. With 20 minutes left, the Granata did double their lead when Giuseppe Vives' through ball found Alessio Cerci in space and the Italian international calmy side footed the ball past Avramov. Torino had a nervy last ten minutes to contend with when Nene's poweful header beat Padelli, but Toro were able to hold on to clinch a crucial victory. After losing in the dying seconds against Roma on Tuesday evening, Torino will be hoping for a second consecutive home victory when they face Cagliari on Sunday evening. Toro will be without top scorer Ciro Immobile and Emiliano Moretti who are both suspended, and are likely to be replaced by Riccardo Meggiorini and Guillermo Rodriguez in the starting line up. Due to the two suspensions, Giampiero Ventura has called up Primavera players Mattia Aramu and Emmanuel Gyasi to the squad, and with Paulo Barreto also missing, their is a chance either player could feature. Opponents Cagliari are currently six points clear of the bottom three, and would therefore feel that they are relatively safe from being relegated. 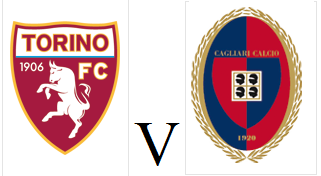 However, having not won any of fourteen away games this season they will be looking to change that statistic against Torino - a team they have beaten in all three games since the Granata returned to Serie A. For the second time in three games, Torino conceded a winning goal in injury time as Alessandro Florenzi's late strike denied Toro a deserved point. Giampiero Ventura decided to keep faith with the team who beat Livorno on Saturday, and the experienced tactician was hoping for a similar performance against Roma. Roma had the first real chance of the game when Daniele De Rossi dummied a Maicon cross for Francesco Totti to strike, but the Roma captain hit it straight at Toro keeper Daniele Padelli. Toro's first chance of the half came via Ciro Immobile, but the prolific striker fired wide of the target. The home side came extremely close to taking the lead, but were denied by a sensational double save by Daniele Padelli, who denied Mattia Destro and then Miralem Pjanic in quick succession. However, just before the break Roma did take the lead, as Jasmin Kurtic inadvertently played the ball through to Destro who calmly lifted the ball over Padelli to score. However, six minutes into the second half Torino were back on level terms in sensational fashion as that man Immobile scored once again. Giuseppe Vives chipped a through ball forward from the half way line that travelled over 50 yards before finding Immobile, who connected with an exquisite left foot volley that flew past Morgan De Sanctis. Toro were galvanised after their equaliser, and came close to taking the lead on the counter attack, but Alessio Cerci's volley went agonisingly wide. At the other end, Gervinho also went narrowly close to giving Roma the lead, but his shot from close range was also off target. The Granata were continuing to create chances, and thought they had scored a dramatic late winner when Jasmin Kurtic's shot deflected off captain Kamil Glik, but once again it was wide of the post. However, the drama was still to come as Roma scored a winning goal in the 91st minute, when Gervinho found Alessandro Florenzi in space, and the midfielder smashed the ball past Padelli to deny Toro a point. Despite the disappointing ending, Toro fans had plenty to be proud of from their teams performance on Tuesday night, and a similar display against Cagliari on Sunday will almost certainly result in three points. Just 72 hours after their last fixture, Torino are back in action on Tuesday evening as they face the long trip south to play 2nd placed Roma. 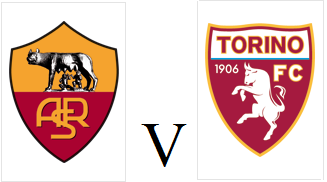 Toro are not expected to make many changes from the side that beat Livorno on Saturday, but former Roma man Panagiotis Tachtsidis and Montenegrin international Marko Vesovic could be in contention. Whilst their battle with Juventus for the scudetto does seem to be a foregone conclusion, Roma are in decent form having won four of their last six and having lost only two games all season. However, the fact that key central defender Mehdi Benatia is suspended could give Toro some hope. Torino finally ended their horrendous run of recent form as they convincingly beat relegation threatened Livorno thanks to Ciro Immobile's hat trick. As expected, Immobile and Alessio Cerci returned to the starting eleven whilst Giuseppe Vives also replaced Panagiotis Tachtsidis after suspension. The home side made the brighter start, and Livorno keeper Francesco Bardi had to make saves to deny Alessio Cerci and then Jasmin Kurtic. However, mid way through the first half, Toro took the lead when Cesare Bovo's free kick was headed in by Ciro Immobile - Torino's 3000th goal in Serie A.
Cesare Bovo almost doubled Toro's lead, but his speculative long range effort was tipped over the bar by Bardi, who was having a particularly busy evening. Alessio Cerci twice had good chances to end his own four game goal drought, but once again Bardi was up to the task. An excellent move between Torino's front two almost resulted in a goal at the start of the second half, but once again Cerci was denied. Toro finally got a second goal that their play deserved in slightly fortuitous circumstances as Ciro Immobile's mis-hit volley somehow found the bottom corner. However, there was nothing lucky about Immobile's hat trick goal as the striker picked the ball up outside of the area before firing the ball into the bottom corner. In the final minute, Livorno did get a goal back when Daniele Padelli failed to deal with a corner, and that allowed Luca Siligardi to volley into an empty net from outside the area. However, despite that late setback, this was an impressive result and performance by Torino, albeit against a poor Livorno side. 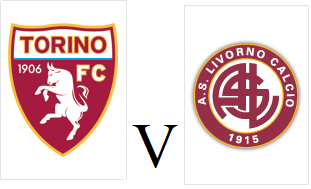 Torino face one of their most important games of the season, as they look to end a run of four consecutive defeats when they face Livorno on Saturday evening. The Granata have not even scored a goal since a 3-1 victory against Hellas Verona in February, and Giampiero Ventura is likely to recall Alessio Cerci and Ciro Immobile who were suprisingly dropped for Monday's game against Napoli. Torino will be boosted by the fact that Livorno, who are currently fighting against relegation from Serie A, will be without Innocent Emeghara and Ibrahima Mbaye who are both suspended. Torino's poor recent form continued as they fell to a fourth consecutive defeat after a controversial Gonzalo Higuain goal on Monday night. Giampiero Ventura surprisingly chose to leave Alessio Cerci and Ciro Immobile on the bench, preferring instead to start with Paulo Barreto and Riccardo Meggiorini upfront. Elsewhere, Nikola Maksimovic started at right wing back, whilst Matteo Darmian was at left back. It was Riccardo Meggiorini who had the first chance of the game for the Granata, and his half volley forced Pepe Reina into making a save. Toro came close to taking the lead when centre back Cesare Bovo unleashed a powerful shot from distance, but his effort hit the bar. Toro continued to create the better chances in the second half, and Omar El Kaddouri forced Reina into making a save after a slaloming run. Napoli's first real chance came mid-way through the second half, as Gonzalo Higuain's shot from the edge of the area was saved by Daniele Padelli. Torino hit the woodwork for the second time when Paulo Barreto played strike partner Riccardo Meggiorini through on goal, but the striker was denied his first goal of the season by the near post. Matteo Darmian came close moments later, but his long range shot was tipped over the bar by Reina. Ciro Immobile and Alessio Cerci both came off the bench as Toro went in search of a winning goal and with twenty minutes remaining the former had the best chance of the match. Jasmin Kurtic won possession for Toro before pulling the ball back for Immobile, but somehow the unmarked Italy international blazed the ball over the bar from 12 yards out. Immobile's former Pescara team mate Lorenzo Insigne came close at the other end, but he was denied by a superb one-handed save by Padelli. However in the 90th minute, Napoli scored an undeserved winner when Higuain raced paced Kamil Glik before firing past the Torino keeper. The Granata were furious with this goal, as replays showed that Higuain had tripped the Polish defender in the build up to the goal. This was an extremely disappointing defeat for Torino, but they can be encouraged by the performance as they outplayed the team who are third in the league for the majority of the match. However, Toro have now gone four games without a point or even a goal, and Toro's hopes of a top ten finish are quickly fading. 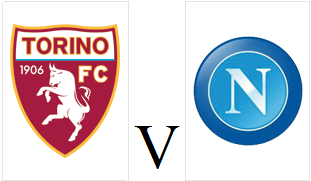 Torino will look to halt a run of three successive defeats when they face Napoli at the Stadio Olimpico on Monday evening. The Granata haven't even scored in their last three games, but Alessio Cerci and Ciro Immobile are almost certain to continue up front. At the back, Toro are boosted by the return of the suspended trio Cesare Bovo, Kamil Glik and Nikola Maksimovic, whilst in midfield, Panagiotis Tachtsidis should replace the suspended Giuseppe Vives. Napoli are unbeaten in their last five games, but that does include two disappointing draws against Livorno and Genoa, and this may give Torino hope that they can gain a result against the Champions League hopefuls. Torino fell to a third consecutive defeat as they fell to a narrow defeat against Inter, despite a spirited second half performance. Despite a number of suspensions at the back, Giampiero Ventura kept faith with a 3-5-2 formation, as Marko Vesovic made his debut at right wing back, and Alexander Farnerud was the unlikely choice to play on the opposite side. Toro had the first chance of the game when Samir Handanovic flapped at an Alessio Cerci corner, and the ball fell to Ciro Immobile, but unfortunately the Italian international blasted the ball over the bar. The home side had their first chance of the game after some excellent wing play down the right hand side by Freddy Guarin, but after pulling the ball back for Rodrigo Palacio, the Argentine saw his header saved by Daniele Padelli. Inter did take the lead on the half hour mark when Esteban Cambiasso's chipped ball found Palacio who this time found the target with a header from an acute angle. Toro took the game to their hosts in the second half, as both Jasmin Kurtic and Alessio Cerci forced Handanovic into making saves. Migjen Basha, fresh from scoring for Albania in mid-week almost scored an equaliser for Torino, but his long range volley went narrowly wide of the post. Despite their second half pressure, the Granata were unable to find a breakthrough and there poor run of form continues. Their recent run of three games without a goal illustrates more than ever that unless Immobile and Cerci are on form, there aren't a large number of goalscoring options in the squad. 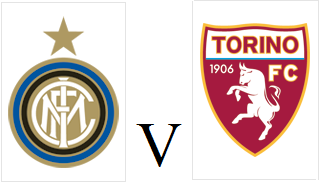 Torino will travel to the San Siro to face Inter Milan having lost three of their last four games and with three first choice centre backs suspended. Kamil Glik, Cesare Bovo and Nikola Maksimovic all received yellow cards in the defeat against Sampdoria so will miss this game due to suspension, whilst Salvatore Masiello and Giovanni Pasquale are both injured. Due to this crisis at the back, Toro should revert to a back four against Inter and Marko Vesovic could also make his debut. Giampiero Ventura has also called up three Primavera players for this game, as for the first time Antonio Barreca, Mattia Aramu and Emmanuel Gyasi are called up for the senior side. The home side are in reasonable form, and are unbeaten in their last four games - however in recent games at the San Siro they have only managed to pick up a disappointing six points in games against Chievo, Catania, Cagliari and Sassuolo. Torino fell to their third defeat in four matches, as they lost a second successive home game against Sampdoria on Sunday afternoon. Toro made two changes from the side who were beaten by Juventus, as Nikola Maksimovic replaced the injured Emiliano Moretti, whilst Alexander Farnerud replaced the suspended Omar El Kaddouri. However the home side were behind after only seven minutes after poor defending from a set piece allowed an unmarked Stefano Okako to side foot past Daniele Padelli. Replays suggested that the former Roma front man may have been offside, but Toro still should have cleared the danger before that point. Okaka could have scored again moments later, but after lobbing the ball over Padelli, he was unlucky to see the ball hit the bar and Cesare Bovo was able to clear the danger. The Granata were creating chances though, and Samp keeper Angelo Da Costa had to be alert to first deny Ciro Immobile, and then Alessio Cerci from close range. At the start of the second half, a speculative shot from distance from Jasmin Kurtic narrowly whistled past the post. Kamil Glik and then Ciro Immobile both should have done better with half chances, and despite the introduction of Paulo Barreto and Riccardo Meggiorini, Toro couldn't find a breakthrough. With ten minutes remaining, Sampdoria put the result beyond doubt as Manolo Gabbiadini curled a sensational long range free kick past Padelli to double their lead. This was a disappointing defeat for Toro as for the second home game in succession the Granata failed to beat a team they were expected to. Further problems may occur in the next match against Inter, as they will be without four of their first choice centre backs, with Glik, Bovo, Maksimovic suspended, and Moretti injured. With matches against Napoli and Roma before the end of the month Torino's hopes of a top ten finish are beginning to look unlikely. 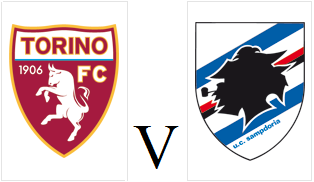 Torino will be looking to bounce back from their narrow defeat in the derby, when they face Sampdoria at home on Sunday afternoon. The Granata will be forced into making at least two changes as defender Emiliano Moretti is injured, whilst Omar El Kaddouri who was unfortunate not be awarded a penalty against Juventus, is suspended. Despite losing their last home game against Bologna, Toro's home record has been impressive this season as they have picked up 20 points at the Stadio Olimpico. In comparison, Sampdoria have only picked up 12 points away from home this season, although their form has improved since Siniša Mihajlović took over as coach. However, they come into this game having lost their last two, although in fairness, they were matches against Roma and Milan.